New book, 80 pages, SS10241. The Republic F-105 Thunderchief was the largest single-seat, single engine combat aircraft to enter production, was conceived as supersonic, low altitude fighter-bomber capable of delivering a heavy nuclear payload. 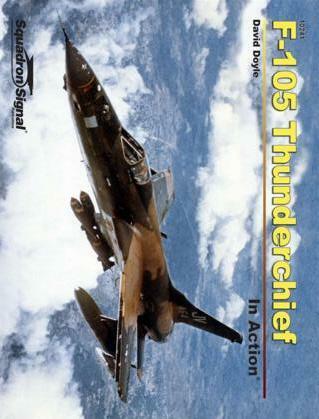 While never used as intended, the Thunderchief did see extensive combat. The F-105 carried the brunt of the U.S. bombing campaign during the early part of the U.S. involvement in Vietnam by completing more than 20,000 sorties. While serviced and flown by brave and competent men, the extremely sophisticated Mach 2-capable F-105, or 'Thud' as the type was nicknamed, was ill suited for repetitive missions in humid Southeast Asia. Maintenance requirements exceeded 100 man-hours labor per flight hour. Further, combat losses rose to almost half of the 833-unit production total. Ultimately, the F-105 was withdrawn from the theater. Features development, production and deployment of the seven Thunderchief models with nearly 200 vintage photos, more than half are in original color, augmented with a dozen line drawings and eight color profiles. This item was added to our catalog on Wednesday 21 December, 2016.